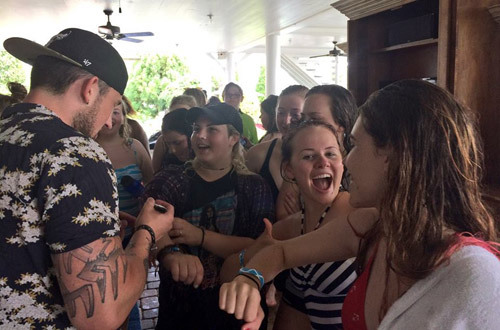 This week, Mercy Multiplied’s Nashville residents had the unique opportunity to experience Christ through water sports. For several years, Mercy has partnered with “In His Wakes,” a ministry that shares Christ’s love through water sports programming. The goal is for participants to “get off the dock” and push past barriers of fear and distrust. Since 2003, In His Wakes has impacted over 15,000 at-risk children. They have two outreach programs, “A Day to Remember” and “On the Shores.” Their outreach is an effective tool that brings hope and healing to a hurting world. On Monday, the Nashville residents headed to the Cumberland River with staff and volunteers to work through their fears. The In His Wakes group challenged the residents to consider the correlation between water sports and a relationship with Christ. 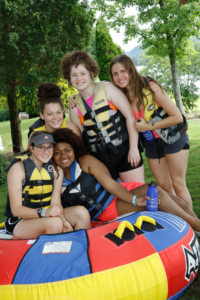 The girls broke into groups and went into boats where they began their water adventure. The residents had the opportunity to ski, tube, and knee board. For some girls, even entering the water took courage and encouragement from the volunteers and staff. Groups rotated throughout the day to ensure everyone had the opportunity to experience each activity. Country artist, Michael Ray, made an appearance at the event. He welcomed and encouraged the girls, as well as signed autographs and joined them on the boat for the activities. Mercy residents were able to let loose and have fun while they learned how to work together and encourage each other as a team. Each girl’s self-worth was boosted as she was admired for her courage and confidence. After the boating experience, the In His Wakes staff shared to gospel with the residents. The staff offered an opportunity for the girls to dedicate their lives to Christ and even to be baptized. 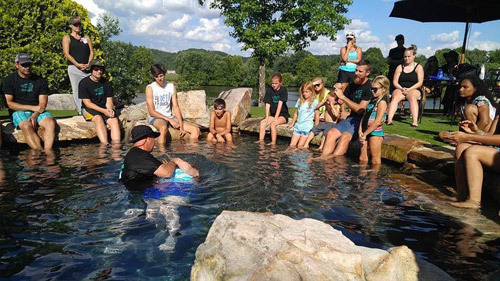 In total, twelve Mercy residents were baptized at the event. In His Wakes was the most fun I’ve had in a long time. I have never had many manly figures in my life, so it was nice to be around Godly men. They acted so nice and polite, unlike any other guy I have ever met, so it gave me a different view of men. That was really cool. I’m extremely appreciative of all the volunteers and for the whole event. In His Wakes was totally mind-blowing. Not only did they challenge us physically and mentally, but also spiritually. You could feel the air change when they were talking about God. Truly, more hearts were touched today than there have been since I got here three months ago. I can’t wait to see how those lives are going to be lived out for the Lord. Today was so fun! Even though I was scared to do anything, I ended up doing everything! I have been terrified of water for a long time. But today I conquered all of that fear and trusted the boat drivers. I even jumped off of the boat, and it was amazing! In His Wakes was so much fun; it was my most favorite Mercy event. It was really cool to see nature, and to think God made all of that is amazing. It was cool to see that the woman presenter gave glory to God in something she just does –Wakeboarding. It was a fun bonding experience with the Mercy girls. God is good! It is so ironic that we would be going to this cool event a day after my birthday. I had the best day ever. I had never been on a boat or tubing before. I was nervous, but I am so glad I did it. I had also been wanting to be baptized ever since I rededicated my life to Christ, so that was amazing that it happened today! I will never forget all of the staff and volunteers or this day! What a life changing experience. Mercy is thankful for the ministry of “In His Wakes” and their partnership with Mercy all these years. They truly do bring joy to our residents and reiterate the Christ-centered approach to healing that Mercy seeks to provide. For more information on how you or your organization can partner with Mercy, please visit Partner With Us.